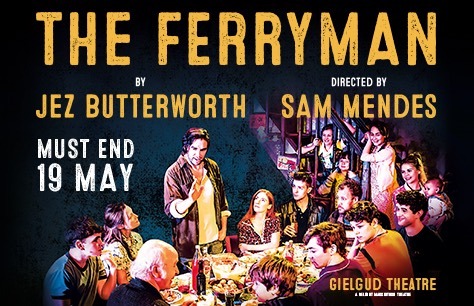 The Ferryman has been extended, get tickets now to see one of the West End's most sought after shows! Northern Ireland, 1981. The Carney family prepare for the annual harvest with a day of hard work on the land and a traditional night of feasting and celebration ahead. But this year they will be interrupted by a visitor. Adolescents under 14 will not be admitted. Booking until 19 May 2018. If I could give no stars - I would! This play was full of gratuitous swearing which made it completely distracting to understanding any of the characters in depth. Together with the unbelievable character of Tom Kettle and the not funny 'jokes', the sooner I can forget about this experience the better. Very good script, good acting by most of the adults, not by the majority of the children. Unf. the diction of most of the adults was poor, so although I have excellent hearing, I only understood about 75% of what was being said. What was outstanding was the effect that "The Troubles" had on ordinary people, which was not altogether common knowledge in the UK at the time, so for that I applaud the play. Overall I expected to be on the edge of my seat, and I was not. The actors being mic'd I feel led to their inability (or lack of training) to project and enunciate. The chap who played Muldoon was exceptional, very very good indeed.